Today I’m posting a bit of a thrifty recipe as I re-used the leftover mixture from another recipe to develop this one. 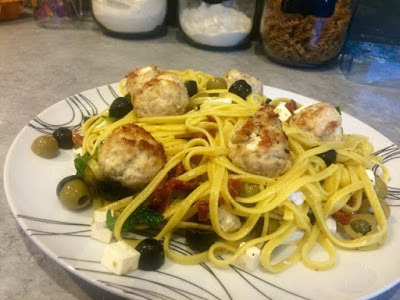 You may have seen my previous Greek Style Turkey Burgers post and these meatballs follow exactly the same recipe as those burger patties. This came about as I was just cooking for myself for a couple of days and didn’t want to eat the same dinner two days in a row. I wanted something I could use over two days and make two completely different meals from. Mince is a really versatile ingredient as it can be turned into pies, meatballs, koftas, kebabs, burgers… this list goes on. I pretty much always have a packet of either beef or lamb mince in the freezer for a rainy day. Lately however, I’ve been a bit partial to turkey mince. I started buying it as it’s leaner and healthier but I’ve stuck to it as I actually quite enjoy the flavour. 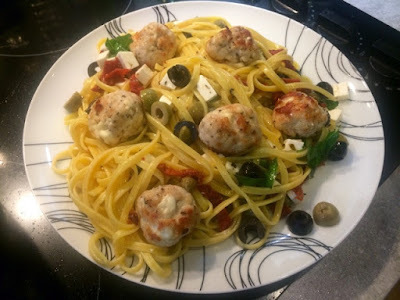 Rather than making a traditional tomato sauce to go with my pasta and meatballs I thought I’d go for a lighter more summery dish and, using the feta in the meatballs, continue with the Greek theme. Olives, sun dried tomatoes and capers are all good store cupboard ingredients, ideal for knocking together quick pasta dishes. I’ve used linguine this time, spaghetti or tagliatelle would be ideal substitutes but really any pasta would work. 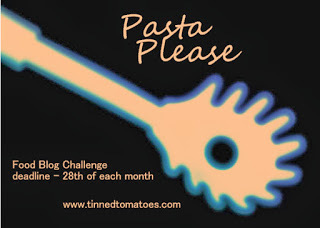 I’m entering this recipe into Pasta Please challenge run by Tinned Tomatoes and this month hosted by the excellent A Mummy Too where you can find lots more yummy pasta recipes from all the other food bloggers participating. Both are excellent blogs with loads of great recipes that I’m always browsing for inspiration so I strongly suggest you have a browse while you’re there! 1. 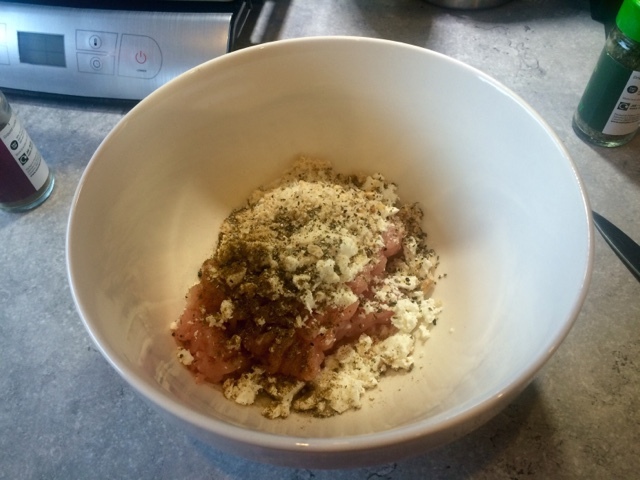 Put the turkey mince, feta, cumin, dried basil, breadcrumbs, sat and pepper into a bowl and mix until everything is evenly combined. 2. 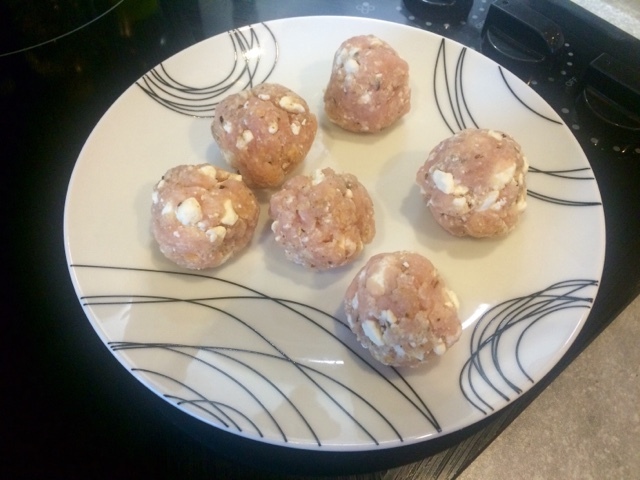 Use your hands to take small chunks of the mixture and roll into balls. 3. Put pasta on to boil in salted water according to packet instructions. 4. Heat the vegetable oil in a frying pan to a medium-high temperature. Add the meatballs (in batches if the pan is too crowded) turning them regularly until browned on all sides and cooked through. 5. Drain pasta. 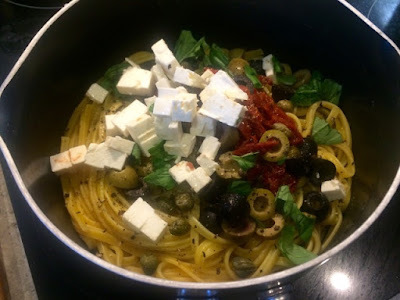 Add the feta, tomatoes, capers and olives. Add a good drizzle of extra virgin olive oil. Season well with salt and pepper and give it a good mix. 6. 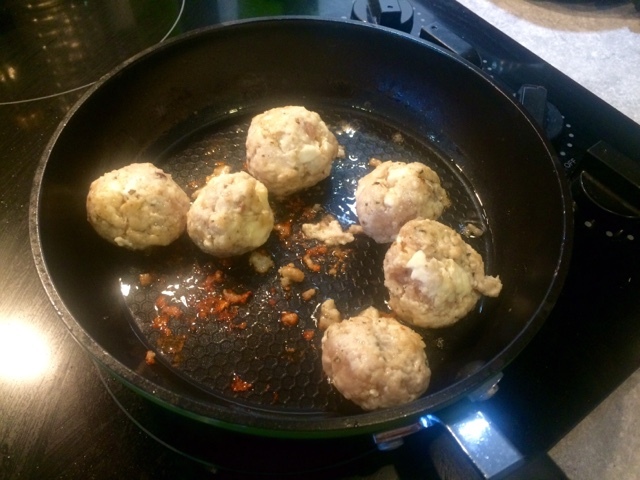 Serve on a warm plate and top with the meatballs.